Myriad are the terrains of this surface… patterned across the span by its local, to tell tales of their patch…. Do they weave flora on it, or dig minerals from deep within, is it to live through the harsh rocky mountains… surviving the subzero climates to emerge with the rising summer sun and melting glaciers…. white as flakes, soft as the undercoat of the goat dotting their clear blue skies… Or imitating the lush tropical forests offering not just their silhouettes but also colours to fill them…. Going back in time, the garments worn in Vedic period mainly included a single cloth wrapped around the whole body and draped over shoulders for reasons aesthetic and functional. Victorian era saw Bengal take up to covering torso with blouses for the first time. 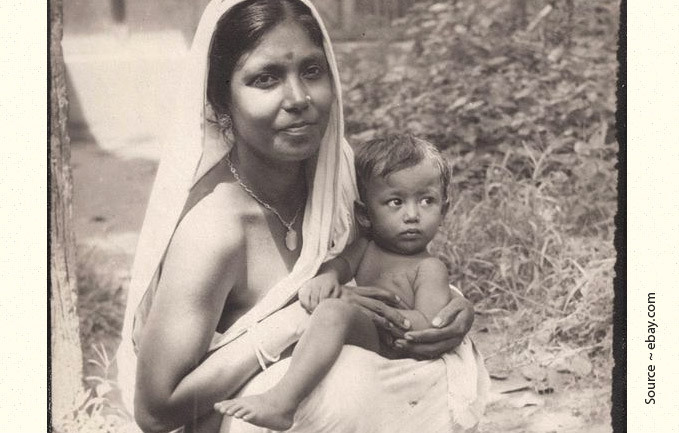 Women not wearing blouses under their saris did not suit Victorian society, which had its own ideas of propriety and blouses increasingly became a norm. The term ‘blouse’ and ‘petticoat’, both of English origin made a leap into the Indian vocabulary in this era. 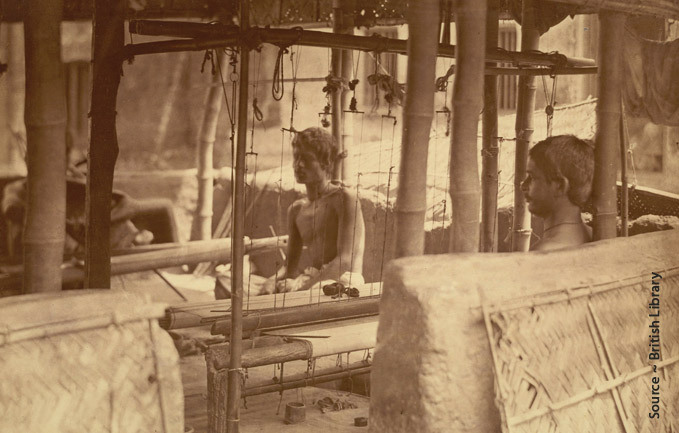 Even today Bengal is famous for its weaving tradition…. many small towns and villages like Fulia, Baluchari, Begampur, Atpur are keeping this culture alive. 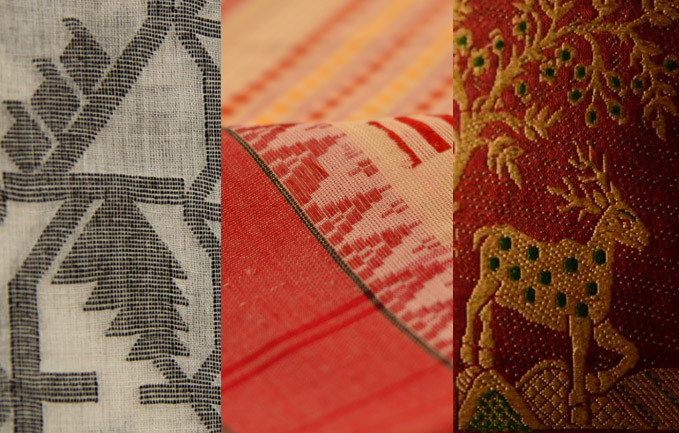 Begampur is a small town famous for its saree weaving in Hooghly district, these sarees can be identified by their loosely woven, light-weight and translucent made and have contrasting borders in red, black, purple, orange etc. These are also emphasized by a serrated edge motif. 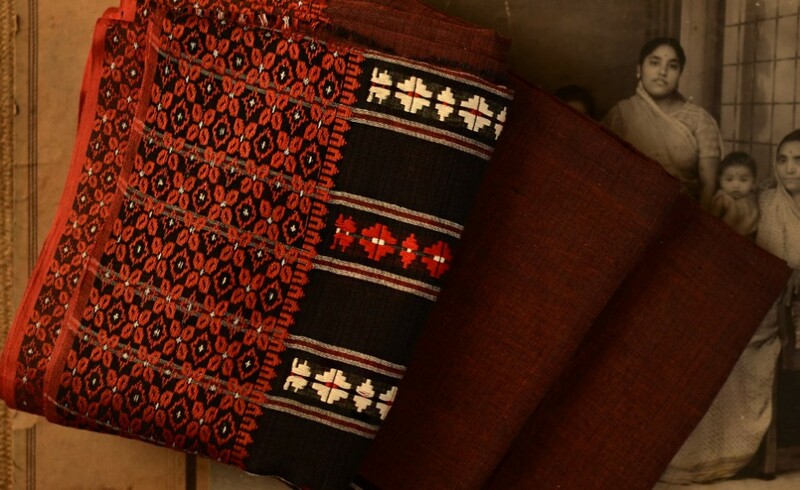 Narrow borders are woven with designs of a variety of stripes and figured motifs using dyed cotton yarn on the weft. 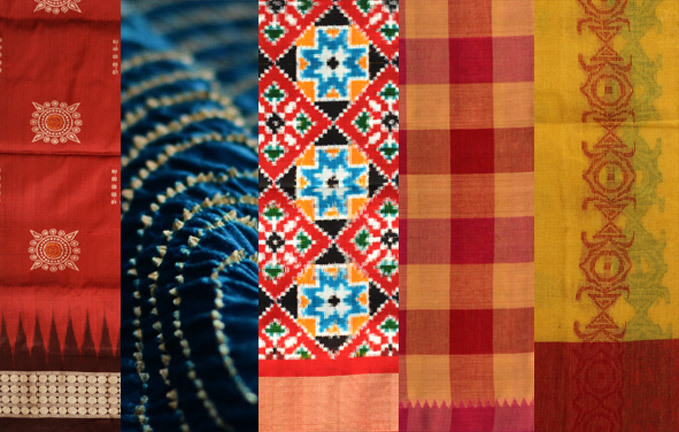 Cotton sarees are locally known as ‘Matapar’ sarees, which means they have simple borders without any ornamentation and are woven with coarser cotton yarn. They come mainly in colored stripes and check patterns, with designs in the border. 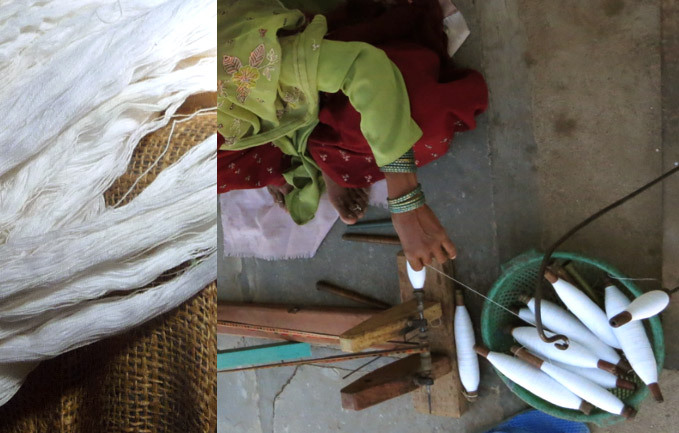 The process of making a saree starts with procuring of cotton threads. Bundles of cotton threads are bought from the factory or local market. The starch used for sizing is mainly sage, arrowroot, rice or wheat. They are first washed to remove any chemicals. After a couple of washes, on the bases of colour and design, the yarn is dipped in boiling coloured water for dyeing. Threads are wound on bamboo drums to feed them into the loom for weaving. Today, sectional warping machines are used for warping and are replacing the age old street warping practice. 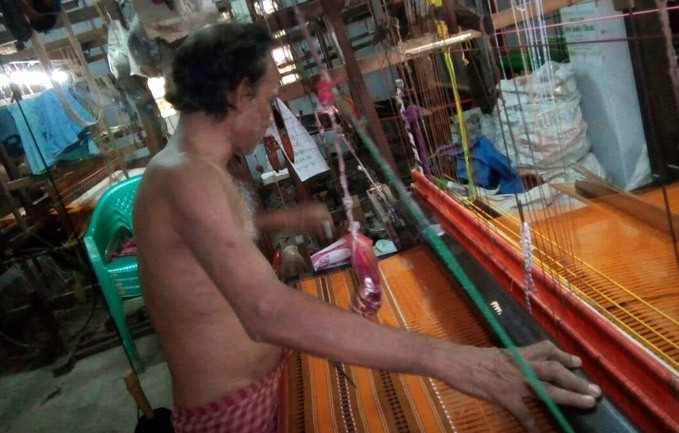 Weavers use a pit loom or frame loom for weaving Begampuri saree with extra warp of 2/100s or 2/80s cotton yarn. 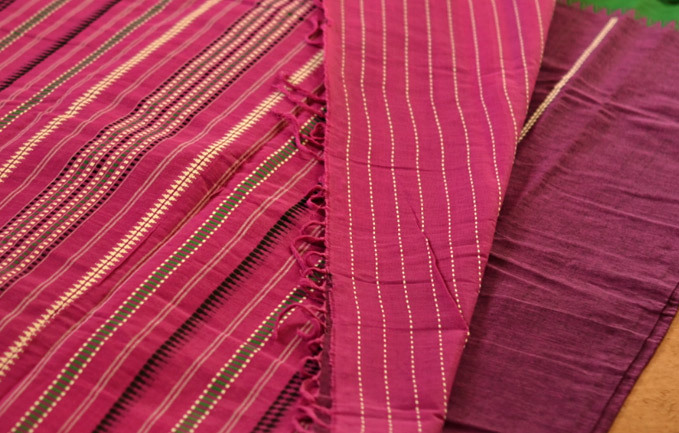 For a long time handloom weavers of the region were making only ‘Matapar’ saris. In the cluster interventions by government and local organisations, weavers were given training’s in designing, dyeing, preparatory processes like drum warping, sizing etc. This resulted in opening their imagination to producing newer varieties. 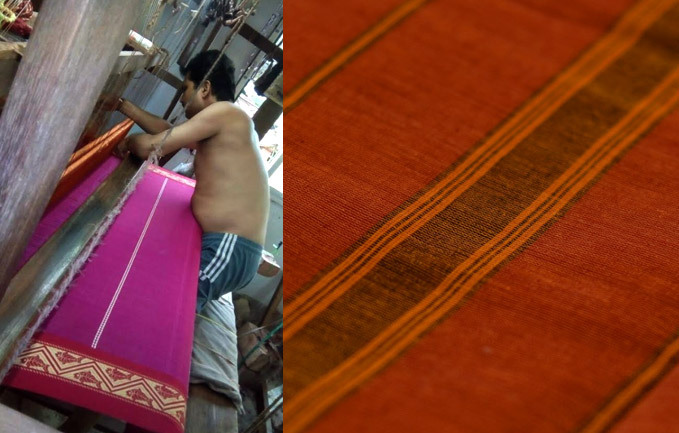 Attention to producing quality cotton sarees by adopting new techniques and modifications is a priority in the making process now.